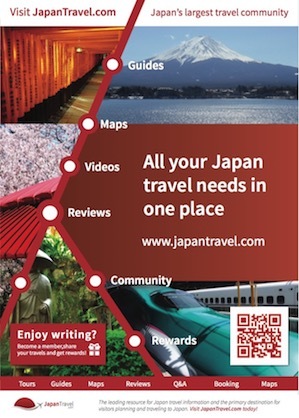 Our Content & Style Guide outlines how to get started as a writer on JapanTravel.com. If you've not already done so, please sign up to join our community. At Japan Travel, we're building the most comprehensive tourism guide about Japan. Want to write? We're looking for travel guide-style articles that combine your personal experience, interwoven with a healthy dose of facts, description and insights. We want each article to provide clear, friendly information about Japan's many tourist attractions. Looking to blog? We also support blog-style articles, for those wanting to write-up their own personal experiences, or diary-like adventures. We aim to inform readers by compiling as much accurate information as possible, while entertaining them and writing in a friendly, positive and upbeat style. We aim to be a voice of experience and want to share your insights with our readers. We're primarily interested in granular content i.e. writing about individual locations. This could be a tourist attraction, hotel or restaurant. Our site's categorisation and search navigation then allows people to find your content more easily. We're interested in original content featuring places yet to be covered for the site. If you are keen to write about a place already documented, please consult your Regional Partner first. We're interested in covering locations from new angles and also improving article detail and photo quality over existing contributions – these are 2 examples where covering the same location twice is a possibility. The following guidelines apply to all content created on Japan Travel. Please take the time to review them when starting out, as well as any format-specific notes further below. Provide as much information and detail as you can, researching the place you are writing about, as well as sharing your experiences. Don't duplicate text from other sites or plagiarise at all – always write in your own words and submit original content. Keep in mind our readers are not all experts in Japanese culture, so try to link to other Japan Travel articles where possible or take the time to explain a particular Japanese term you may have used. If you must link to an external website, please only link to official websites for a tourist spot or business. Try to be succinct and avoid using redundant words or convoluted explanations. Keep paragraphs short to make it easier for the reader. Use "Title Case" for titles and "Sentence case" for sub-titles. Always include an SEO description of 20-25 words. Choose a category and sub-category to ensure your article is tagged accordingly. Three or more high-quality photographs: focused, good lighting and composition and relevant to the article. We reserve the right to remove photos that are redundant or insufficient quality. The first photo has highest visibility so think about showcasing one of your best. Photoshop or editing is acceptable if you need to optimise photos, but we don't permit watermarks or datestamps. Please include a descriptive caption for every photo uploaded. Photographs must be your own, or you must have permission to publish if somebody else’s. If a photo is not your own, you must still provide an appropriate photo credit – even if you have permission to publish. Please respect the rules and regulations for taking photographs at any facility you visit. We don't allow risqué shots unless context justifies (customers wearing towels at onsen, art, etc). We don't allow shots of children that might show their identity. Please respect people's privacy when thinking about choosing which photos to upload – faces in a photo background is fine when taken in a public area, but if they are the subject of your photo, make sure you have their permission to publish. All articles must have an address added. Map pins can be added via the Japanese address field. Please add official website information – this allows us to quickly verify information too. Please don't link to non-official websites, as we cannot be responsible for the information they publish. Telephone numbers and e-mail addresses are also useful to our audience, so if you have this information, please input alongside your article. The scope for the main article type is individual location reports or place reviews. Addresses, SEO description and categorisation are vital. Contact information also welcome where necessary. Photo Stories are designed for communicating in photos, or where you want to provide a more in-depth commentary with each image. Videos are synced with our YouTube channel. 150+ words. English only for now! You must have the right to publish any tracked used, but free options exist. Guides cover practical, how-to information on a range of topics, in an easy-to-navigate, logically-structured format. 300+ words. Guides need to be comprehensive to be useful, with section headings for easy navigation. Determine a structure and make sure your guide is split up into at least 3 parts, as well as including a basic introduction. Our Events section aims to showcase diverse range of events around Japan – from annual festivals to local activities. 150+ words. Factual and neutrally written. 3+ photos minimum (no maximum). Captions required. Please add dates and times. Multiple variants supported. We must be able to verify any event submitted. If the event you are writing about is a recurring event, try not to mention specific dates within the text, beyond the expected timing (e.g. second weekend of the month). Our News section summarises commentary on the latest updates in the Japan travel industry. 300+ words. News articles don't need to be extensive, but must be worth publishing. One photo is sufficient – make sure you have the right to use. News must be topical, either published in advance or within the same week. We must be able to verify information, so include a website link. Our blogs showcase more freeform articles on Japanese culture, travel and society. Be sure to ask an actual question in the Subject field. Images are optional, but are useful to include if relevant. Add relevant tags where possible. We will generally remove duplicate questions but also point the user to where the answer can be found. Where are the best views in Tokyo? What are the best travel apps Japan? JapanTravel.com now supports 13 languages including English, Japanese, Chinese (Simplified and Traditional), Korean, Thai, French, Indonesian, Russian, Portuguese, Arabic and Spanish. Translations must be of a native written standard, as we cannot re-write submissions that are not of near-publishable standard. Translations should be localised to some extent to target the audience you are writing for – we cannot publish translated material that does not make sense to readers of that language. Links should be localized whenever possible. Links may be omitted if no localized version exist. Links for important travel purposes (e.g. online purchase of tickets or tours) existing only in English should be maintained as is. When signing up, every contributor is assigned to a Regional Partner. Our Regional Partners represent each of Japan's prefectures, and know their assigned prefectures in considerable detail. If you are located within one of Japan's 47 prefectures, we'll make sure you get assigned to your local partner who will help you get started. They will not only act as your editor for new contributions, but will also be able to suggest ideas for contributing to the site. As a contributor, make sure to complete all fields for your content. Before submitting your piece, make sure you have proof-read your article at least once and checked the article in 'Preview' (this option exists at the top of the CMS). If have any queries, you can use the messaging area to contact your Regional Partner. When you have submitted a new piece of content, your Regional Partner will be notified and aim to proofread and check your submission. If everything is okay, your submission should be published within 24-48 hours, but feedback and suggestions might mean it takes longer. When your Regional Partner approves your submission, you'll receive a notification. Congratulations – you are now published on Japan Travel! Published content and the Regional Partner network is overseen and supervised by our Content Manager, who'll make sure new content adheres to our guidelines and will occasionally provide feedback to both contributors and our partners. We showcase the best submissions both around the site and on our social media – we hope that we can share your article too! Regardless of the content type or format, our community of partners, editors and Content Managers will moderate activity around the site on a regular basis. We'll make quick fixes, correct typos, remove redundant words and occasionally re-phrase for clarity, but we won't re-write or correct whole articles. This is definitely worth bearing in mind when translating, as we'll insist you are of native written level in order to have your submissions published to the site. We reserve the right to remove photos that are redundant or of insufficient quality. We'll also re-arrange photos to best represent the content. We reserve the right to make minor changes to texts on the site – if it's a major change, we'll try to discuss it with individual authors in the first instance. Regarding JapanTravel Questions, we'll routinely moderate both questions and answers published to the site. We routinely moderate comments on the site. Comments should be in the language of the site you are on. If you want to flag a query or feedback to the author or content staff, please email us instead. We operate a website specifically about travel to Japan and from the beginning have committed not to take any stance over non-travel events and issues. We ask for your co-operation in respecting our desire for neutrality and to post your political views on other more appropriate fora. Irrelevant comments may be removed. Neutrality does not mean we support ignorance, and you may find open-topic comment policies on other Japan sites welcome you to post your views. We moderate profiles on the site. Although we are not ultimately responsible for their content, we'll intervene if there are inappropriate or offensive photos, text or links. We promote individual writing styles and creative expression, but this content and style guide helps us to keep JapanTravel.com a consistent experience for our audience. The following sections outline some suggestions for adhering to a standardised format and unified approach to style on the site. Entertain the reader and write in a friendly, positive and upbeat style. Do not indent paragraphs or add empty lines between them. Write short paragraphs of 2-3 sentences and use one space between sentences. Use American-English for place names so they match the Japanese version eg "Kobe Harborland". Short photo captions should not use full-stops, unless using multiple clauses. Don’t repeat yourself and don't overuse short vowel words. Don't overuse conjunctions to keep a sentence going. Start a new sentence. Convey prices as ¥100 or ¥5,400, not 100 yen or 5400 yen. “Wi-Fi”, not Wifi, wifi or Wi-fi. Refer to 'east' and 'west', not 'left' and 'right' (which could disorientate someone facing the wrong way). Capitalization: Japanese words are not capitalized unless they are proper nouns — note that samurai and geisha are not proper nouns and therefore should not be capitalized. Particles are not capitalized (even in titles: Tokyo no Monogatari) and neither are suffixes unless translated as part of a proper name (e.g. Chiba-ken becomes Chiba Prefecture). Brand names: Many Japanese place and brand names are capitalized for effect but should otherwise be written in as normal e.g. Line messaging app, not LINE messaging app (just like “Facebook” is not “facebook”, the stylised logo version). The exception is with assignments, where we will accommodate a partner's request. Italics: Loan words such as geisha, tsunami, karaoke, shiatsu, haiku and sushi are not italicized, nor is bento. Other words should be italicized on their first usage in a piece and defined in parenthesis. They remain un-italicized on subsequent use. Proper nouns are not italicized. Hyphens: When using hyphens with Japanese words, there are no hard and fast rules but do consider what is good readability e.g. Nagoya-ekimae, not Nagoyaekimae. Suffixes: Don’t use redundant place name suffixes. Write Sumida-gawa or Sumida river and not Sumida-gawa river. Watch out for –jima (island), Dori (street) and other common suffixes and either translate them or leave the place name in Japanese. Kanji: Use kanji/kana sparingly and only when strictly necessary (e.g. to follow a sign that is not in English).